Wilder's Our Town not only freed theater from its fourth wall, it freed Shakespeare. 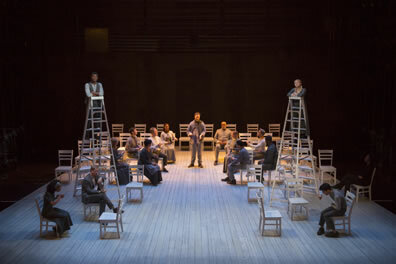 The welding of two American classics, Thornton Wilder's Our Town and Ford's Theatre in Washington, D.C., turns out to have as much to say about Shakespeare as it does about 20th century theater or U.S. history. Ford's Theatre is celebrating the 75th anniversary of the debut of Wilder's Pulitzer Prize–winning play with a new production directed with perfect simplicity by Stephen Rayne. George Gibbs (Nickolas Vaughan) and Emily Webb (Alyssa Gagarin) look out their upstairs bedroom windows at the full moon as other townfolk attend choir practice in the imaginary Grover's Corners of Our Town, Thornton Wilder's play directed by Stephen Rayne at Ford's Theatre. Photo by T. Charles Erickson, Ford's Theatre. For me, this was a double first. I had never seen Our Town before, though I was familiar with key elements of the popular piece, and I had never seen a play at Ford's Theatre before, though, several years ago with my sons I had visited the site where President Abraham Lincoln was assassinated. In 1861, John T. Ford turned an abandoned First Baptist Church into a theater and ran a successful playhouse up until April 14, 1865 when John Wilkes Booth—an actor and brother to America's first great Shakespearean actor, Edwin Booth—shot Lincoln during a production of Our American Cousin. The theater closed after that event and served for a time as federal offices and storage until its interior structures collapsed in 1893, killing 22 workers. After that, it became a warehouse until it became a museum in 1932. A working theater reopened 1968, and another major renovation to the theater and museum came in 2009. It is now operated in a partnership between the National Park Service and Ford's Theatre Society. Ford's is a modern theater with touches of mid–19th century architecture inside its original facade. The box where the first couple sat that April 1865 night remains in place, hung with bunting, ever visible stage left. In the last act of Our Town, set in the town's cemetery, the Stage Manager, played by Portia, refers to a Civil War memorial to local soldiers who fought for the Union, "though they'd never seen more than 50 miles of it themselves. All they knew was the name, friends—the United States of America." Portia turns to Lincoln's box and repeats, with pauses spacing out the words, "The United States of America." What a perfect American setting for a near-perfect play about Americana. However, it's not the palpable sense of history that tugs at you when you enter the theater; it's the set by Tony Cisek, who creates a stunning visual out of Wilder's instructions for a bare platform with plain chairs. Cisek's platform seems to be worn wood planks running at a slope lengthwise from front of stage to back into an infinitely black background, providing an illusion of distant perspective. For the hilltop cemetery, Cisek suspends chairs (some occupied by actors) illuminated by lighting designer Pat Collins so that the tombs they represent seem to be laid into that black infinity surrounding the stage; as the curtain comes up on this scene, the audience gasps in appreciation and shudders at the obvious imagery. The performances of the solid cast are also understated on the surface but filled with psychological and emotional depth. Craig Wallace, an actor whose performances I've noted elsewhere on Shakespeareances.com, is a commanding presence as Mr. Webb, personifying in his portrayal of the newspaper editor the town's friendly but firm personality, dedicated to duty first, fellowship always, and a subtle sense of humor. Kimberly Schraf as Mrs. Webb is mesmerizing, going about her chores with perpetual pleasantness and ingrained smile, yet a sadness hovers about her gestures and lingers in her eyes. Their neighbors across the street, Doc Gibbs (James Konicek) and Mrs. Gibbs (Jenn Walker), wrap their lives and sense of contentment in self-sacrificing responsibility to their community and family, but real happiness seems just beyond their fingertips. Alyssa Gagarin and Nickolas Vaughan play Emily Webb and George Gibbs, respectively, in childlike manner from first act to last, and this works, especially as Emily learns the harsh truths of living, watching it from the other side of the grave in the final scene. The tragedy is not her death or those of other key characters in the play; the tragedy is their lives. Wilder's brilliance is bringing that point to bear in our hearts and guts by writing what seems like a plotless play until we realize its punch has risen within us as we relate the action on the stage to our own workaday existence. Just as important is the play's format, which was revolutionary at the time of its debut in 1938, though, in fact, it was a technique as old as Shakespeare. Theater was a proscenium arch event when Wilder sat down to write Our Town with an imaginary fourth wall separating the players and the audience. Realism was the order of the day, an attempt to replicate authenticity in sets if not in acting (never mind Shakespeare's iambic pentameter verse; nobody ever talked like the characters in Shaw's, Wilde's, or O'Neal's plays, either). Wilder not only got rid of scenery and broke through the fourth wall, he removed any pretense that what we were watching was a play on a stage. His main character is the Stage Manager, prodding us to use our imaginations to see the bare platform as the streets of Grover's Corners, the chairs as houses, and the air above it as the hill on which the cemetery sits. The Stage Manager not only gives us the background of the town and many of its 2,643 residents but tells us what's to come, too, and moves the characters and chairs around as necessary to play out scenes as other actors provide the sound effects of birds, horses, the rain, and wind. The characters use no props; they mime their activities, from shelling peas to leading the milk wagon's horse. Even before the play starts, actors appear singly and take seats, talking among themselves as the audience is doing, too; but while we read our programs and fidget with our phones, the actors are reading imaginary newspapers and doing invisible needlework. The characters speak common talk and directly address the audience, and they play their parts with a minimum of motion (but, subtly, a maximum of acting in their stillness). What should be blasé becomes engaging, what plays as artificial becomes emotionally authentic, what seems a comedy proves to be tragic. By creating a singularly theatrical product, Wilder involves us in life, his characters' and ours. 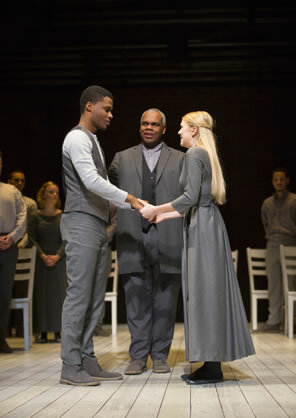 Mr. Webb (Craig Wallace) gives some final advice to George and Emily at their wedding. Photo by T. Charles Erickson, Ford's Theatre. Shakespeare did that, too. He even employed the stage manager device in Henry V with Chorus, who admits that what we are watching is a stage play, not real life; asks us to use our imagination to turn a bare platform into the fields of France and the courts of kings; gives us necessary background on the action and sometimes tells us what's to come; and allegorically moves the players from scene to scene. Shakespeare's stage was a cockpit with an audience all around, and his characters directly engaged with the audience. Whether all of that influenced Wilder is not as important as how much Wilder may have influenced the Shakespeare we are now seeing in our time. Wilder's Our Town not only freed theater from its fourth wall, it freed Shakespeare. Like the rest of theater, productions of Shakespeare's plays became a theater of us watching actors playing characters in elaborate settings and speaking the lines like poets at a reading. More theaters today are learning the greater dramatic wealth and entertainment value in staging Shakespeare's plays in the manner for which he wrote them: on bare stages, requiring our imagination to fill in the sets, and allowing a more naturalistic, conversational mode of verse-speaking (but using the iambic pentameter structure as a pointer for tone and subtextual meaning). It must be acknowledged that Shakespeare, had he been born a couple hundred years later, might also have written brilliant scripts for proscenium arch theaters, or had he been born 400 years later might be producing Oscar-winning blockbuster films. We can see Shakespeare, toward the end of his career, pointing the direction that theater would become, with his use of special effects and elaborate staging techniques. Playing to the tenor of the current time makes sense commercially, and Shakespeare would have done so. He might have even re-imagined his works as many modern directors do, pressing them through cultural and conceptual sieves, allowing specific aspects of the plays to emerge, and leading us toward topical relevance like first-graders in a double line on a visit to the museum. I have seen this done to great effect and resulting in good theater. Imagine, though, 300 years from now in a theater we can't now conceptualize, how some director might place us in a virtual setting for his or her concept of Our Town, moving the fictional Grover's Corner from early 20th century America to another place and time, cutting speeches that the director regards as superfluous, altering the tone of characters, or switching around scenes in order to make a not-so-subtle political or social point pertinent to that time. Wilder's play remains timeless as is, 75 years on from its writing, 100 years on from its setting because we feel its pertinence well up inside of us rather than being bludgeoned with a conceptual hook. Shakespeare, by virtue of his era, similarly wrote his plays to be uncluttered and reliant on the audiences' imagination. Maybe that's why the pure form tends to be more entertaining than notion-based productions, more personally relevant, and more powerful, for by involving our imagination, our psyches become involved, too; and with our psyches, our emotions.